The United States and South Korea have agreed to launch a joint working group to coordinate their North Korea sanctions, a move that reflects Washington’s attempt to bridge the allies’ diverging approaches to denuclearizing the Kim regime, experts said. “The two governments agreed on establishing a new working group that would further strengthen our close coordination on our diplomacy, on our denuclearization efforts, on sanctions implementations, and inter-Korean cooperation that comply with the United Nations sanctions,” Robert Palladino, the State Department’s deputy spokesperson, said. “So this is an additional step that we’re taking that Special Representative (Stephen) Biegun and his team will be leading,” Palladino said. The announcement Tuesday came hours after Biegun returned from Seoul, where he discussed “diplomatic efforts to achieve the final, fully verified denuclearization of North Korea,” Palladino added. The agreement for a joint working group comes as the denuclearization efforts of Washington and Seoul are increasingly at cross-purposes. 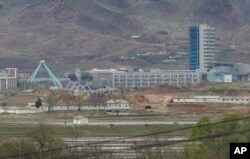 FILE - The Kaesong industrial complex in North Korea is seen, April 24, 2018, from the Taesungdong freedom village inside the demilitarized zone during a press tour in Paju, South Korea. The rival Koreas, on Sept. 14, 2018, have opened their first liaison office near their tense border to facilitate better communication and exchanges. Washington has been keeping sanctions pressure on North Korea as it engages in diplomacy, while Seoul has been prioritizing improving inter-Korean ties through joint economic activities that could violate sanctions, which concerns Washington. Robert Manning, a senior fellow at the Atlantic Council, welcomed the formation of the new working group that he expects would keep inter-Korean activities in balance with the objective of denuclearization. After signing military agreements aimed at reducing tensions and agreeing to pursue inter-Korean economic projects at the Pyongyang summit in September, Seoul and Pyongyang heightened their calls for sanctions relief. South Korean President Moon Jae-in and North Korean leader Kim Jong Un pose for photographs on the top of Mt. Paektu, North Korea, Sept. 20, 2018. Manning criticized South Korean President Moon Jae-in’s initiative in advancing inter-Korean economic ties that counter international sanctions. “President Moon has begun to bump up against the limits of North-South cooperation that are inconsistent with U.N. Security Council sanctions,” Manning said. “It’s very clear to me that the two governments are pursuing policies that are not only poorly coordinated, but they are directly conflicting with each other,” Stanton said. While keeping the dialogue open and engaging with Pyongyang, Washington has been calling for Seoul to maintain pressure on North Korea. Secretary of State Mike Pompeo speaks to reporters at a news conference at the State Department in Washington, Oct. 23, 2018. “And then we do have the intention of President [Donald] Trump and Chairman Kim [Jong Un] getting together before too long, hopefully early in the next year,” he said. Stanton said South Korea has been undermining the U.S. policy of maintaining sanction pressures on Pyongyang as it seeks economic development with the North. 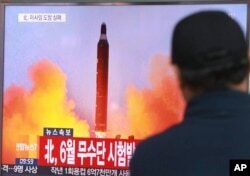 FILE - A man watches a TV news program, Oct. 16, 2016, showing a file image of a missile launch conducted by North Korea. The letters read "North attempted to fire a midrange Musudan missile in June." ​Pyongyang’s Byongjin policy, set forth in 2016 by North Korean leader Kim, aims to develop nuclear weapons and the economy simultaneously. In September, the U.S. Treasury Department made calls to seven South Korean banks, raising concerns about their plans to open branches in North Korea. According to South Korea’s Financial Services Commission, the Treasury Department said it was “deeply concerned” about Seoul’s possible financial cooperation with the North during the call. The Treasury’s calls triggered widespread speculation that the U.S. might consider taking action because of South Korea’s possible financial dealings with North Korea. South Korean banks have been preparing to take advantage of financial opportunities in Pyongyang since inter-Korean relations began thawing earlier this year. The Treasury Department, however, said its direct calls to South Korean banks were “routine interactions” that should not be taken as a signal for a future sanctions action, in an email message sent to VOA’s Korean Service this week. “While we do not speculate on possible sanctions violations or comment on prospective actions, routine interactions should not be misinterpreted as telegraphing a future sanctions action,” a Treasury spokesperson said in the email. U.N. sanctions prohibit creating ventures in North Korea, including financial institutions, and helping Pyongyang gain access to the international financial system. The Treasury Department’s Financial Crimes Enforcement Network (FinCEN) issued an advisory Wednesday, calling for financial institutions to heighten compliance with U.N. and U.S. sanctions on North Korea. The sanctions ban them from engaging in all transactions involving North Korea. William Brown, a former U.S. intelligence official and a professor of North Korean economy at Georgetown University, said establishing a capitalistic banking system in North Korea first requires economic reform. Moon said Thursday that Kim will visit Seoul “soon.” Kim’s visit to South Korea will be the first by a North Korean leader. Also Thursday, a no fly-zone and ban on military drills near the demilitarized zone went into effect as agreed at the September inter-Korean summit. Washington and Seoul are considering whether to conduct joint military exercises next year, and the decision will be made by December. Paul Park contributed to this report, which originated with the VOA Korean Service.